In preparation for our upcoming Sukkot kosher vacation, I was looking through some old family photos from previous Sukkot experiences. I saw a really cute photo from the first Sukkot after we were married: It’s a picture of my husband juggling three etrogs (it was a few days after the holiday was over, so he didn’t have to worry about potentially dropping an etrog and breaking the pitom). In the photo, my husband was juggling only three etrogs. But in this post, dear reader, I will juggle these FOUR fun facts about everyone’s favorite yellow fruit! Similarly, the etrog was also used for a variety of other medicinal purposes. In medieval times, the medical uses of the etrog included treatments for sicknesses of the intestines or lungs, and also as a cure for seasickness. The seasickness one may be related to the fact that the etrog often times had to be imported to Europe from warmer climates, so a seasick seaman might’ve been surrounded by crates of etrogs! Importing the etrogs to the Jewish communities of these colder communities could often come at a high price. In the 19th century, the empress Maria Theresa imposed a huge tariff of 40,000 florins on Bohemian Jews every year so they could import their etrogs, and in the 14th century the Jews of Pisa weren’t allowed to grow their etrogs because the rulers wanted to have the business for themselves. 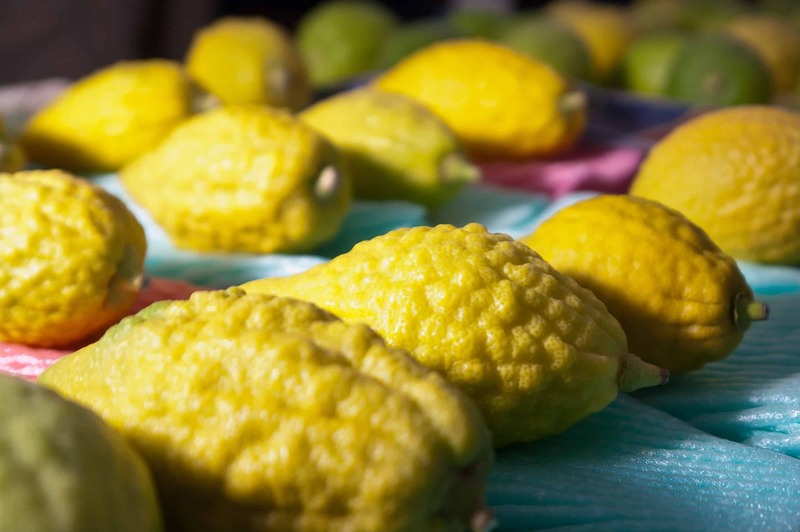 Sukkot is a holiday where water is at the forefront, and the etrog is an especially thirsty fruit. In fact, each of the four species are particularly water-loving plants, and they represent the four different ecological regions of Israel: the etrog is from the coast, the lulav from the desert, the aravot from the rivers, and the hadas from the mountains. Neat! If you want to plan a kosher Sukkot vacation, contact Leisure Time Tours today at 718-528-0700.